If you travel a lot, you probably also stand in line a lot. You can rest your weary feet and make the whole travel process a lot more streamlined by signing up for the Global Entry program, especially if you plan on traveling abroad. Applying for Global Entry isn't rocket science, but it does take some work on your part before you travel. Here's how to do it. You might be familiar with the TSA Precheck program. It's run by the Transportation Security Administration and allows approved applicants to speed through domestic security checkpoints without removing their shoes, laptops, liquids, belts, or light jackets. The Global Entry program is the U.S. Customs and Border Protection's version of an expedited traveler program. If you have Global Entry status, you're entitled to all of the benefits of the TSA Precheck program, but you'll also get expedited entry through customs when traveling abroad. No more waiting in long U.S. customs lines, which means you can be on your way even sooner. Why choose Global Entry over the TSA Precheck program? On the surface, the TSA Precheck program seems like a better deal. It costs $85 to apply, whereas the Global Entry program is $100. 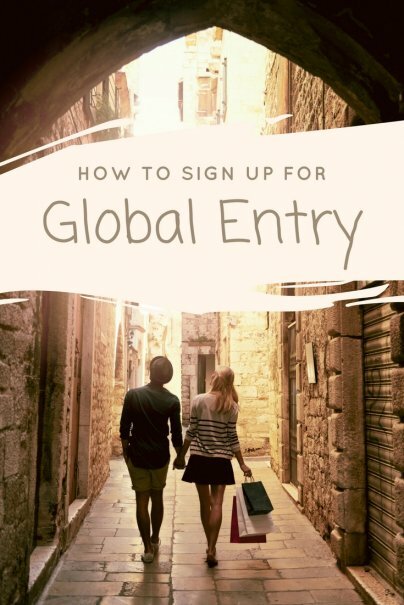 How do you apply for the Global Entry program? You'll need to meet a few criteria to apply for the program. You must be a U.S. citizen or legal permanent resident, and you can't be convicted of or under investigation for a criminal offense. If you meet those qualifications, the next step is to apply for the Global Entry program. To do this you'll need to create an account with the Global Online Enrollment System (GOES). This will be your portal for all Global Entry-related communications throughout the application process and into the future. Once you create a GOES account, you can log in and complete an application for the Global Entry program. You'll need to have some information on hand: your passport, driver's license, and employment and residence history for the past five years. Be patient; the website still looks like it's from 1995. It took me about 38 minutes to complete my application. Finally, you'll need to pay a nonrefundable $100 application fee. Assuming everything checks out, you'll be granted a conditional acceptance into the program. The final step is actually going in to an enrollment center for an in-person interview. These enrollment centers are often located at major airports, so check beforehand to see if you will actually be able to easily get to one for your interview. Apply far in advance of your next international trip. In busy areas, it can take weeks or even months to get an interview appointment. The good news is, a new program called Enrollment on Arrival is available at a select number of airports and allows you to do your interview as you arrive and clear U.S. Customs. However you arrange it, make sure to bring your passport and driver's license for the interview. What happens if you're approved? Congratulations! You'll be issued two things: a known traveler number, and a Global Entry card. Make sure you activate your Global Entry card through your GOES account within 30 days of receiving it. Then enter in your known traveler number when making airline reservations so you can take advantage of the program's features. You can use the TSA Precheck line to zip through security, and you can take advantage of Global Entry kiosks at eligible international airports to bypass the laborious customs re-entry procedures. If you're traveling by land, you can use your Global Entry card when coming back into the United States from Canada or Mexico, in conjunction with the NEXUS and SENTRI programs. SENTRI allows expedited clearance for preapproved travelers arriving in the U.S. from Mexico, and NEXUS does the same thing for travelers from Canada. Simply pop into the NEXUS lanes if you're coming back from Canada, or the SENTRI lanes if you're coming back from Mexico. What are the limits of the Global Entry program? Although the Global Entry program works very similarly to the TSA Precheck and NEXUS programs, there are some differences that could trip you up if you're not careful. If you renew your passport within the five-year Global Entry membership timeline, you'll need to remember to update your passport in your GOES account or you can't use the program. The U.S. Customs and Border Patrol is mute on whether your passengers need Global Entry cards or not if riding with you back into the U.S. through a NEXUS or SENTRI lane. However, to be on the safe side, it's best to assume they do need it, and to avoid these lanes if you're with non-Global Entry passengers. Applying for the Global Entry program sounds intimidating, but it doesn't have to be. All it takes is a little bit of time now so that you can save oodles of time later. After all, you've got better things to be doing than waiting around in lines all day.